Many companies use a framework of levels to chart the seniority of employees. Typically, human resources (HR) teams use levels to calibrate employees across different functions, to make things easier in matters such as compensation. The risk of working with levels is adopting a bureaucratic stance, seeing team members not as people, but as resources within a certain band of experience. Do not let levels define the team. Instead, use levels from the perspective of the team members, who are eager to understand how they can grow and evolve in their careers. Done right, levels are the scaffolding that helps team members elevate. In the chapter, we share a 5-stage levels framework. Because of printing constraints, we couldn’t put the entire framework on a single legible page, so here it is available for download (PDFformatted for 11 x 17, aka Tabloid, and should work in A3 for our friends outside the US). I’m about to tread in some deeply organizationally geeky areas here, so be warned. Since writing the book, and consulting with companies on design org matters, I’ve realized that a solid levels framework acts as a ‘core service,’ plugging into other aspects of running the org. 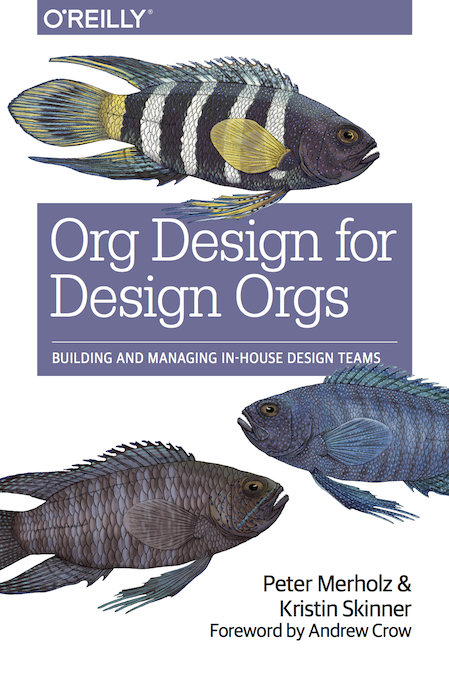 Without this framework, design orgs flail, particularly those with more than 20 members. Most obviously, a strong levels framework assists performance review processes. As team members and managers work together to chart professional growth, having a clear understanding of expectations, and what it means to be promoted, proves essential. And to make sure that this is fair across the whole team, it’s necessary to make these expectations explicit and public, so everyone can see where they fit. Many design managers are cavalier about levels, operating as if they’re not that important. If a team member wants to be called “Senior,” well, what’s the harm in that? As someone who has inherited teams over-leveled people, the harm is that the team member is not being honestly supported in their professional growth. Accelerating people through through levels before they are ready is a set up for failure. And if someone like me comes in and tries to rectify a chaotic situation with a clear framework, these team members feel frustrated as they are inhibited from further promotion until they appropriately shore up their experience and authority. In the Levels framework we developed, progress for designers is tied to skills building. This feels appropriate for a role that is about practice and craft. As stated at the beginning of this post, it’s important to approach your levels framework from the perspective of a team member, particularly one earlier in their career who is figuring out how to grow. This can then tie into a more formal professional development or training program, as designers take classes, attend conference, read books, and practice, either deepening existing skills or acquiring new ones. When opening a requisition for a new team member, how do you know the level of seniority you’re looking for? Many teams either guess, or they don’t bother specifying. More importantly, how do you judge the seniority of a candidate? You can’t rely on their job title, as those are notoriously subject to inflation. Without a levels framework, this assessment is done relative to those who are already in the org – if the candidate seems to be about as senior as Jane, and Jane is a Lead Product Designer, than the candidate is brought in at that level. However, in large design orgs comprised of many teams, that relative ranking becomes dodgy. It might not be apparent that one team’s senior-level candidate might be another team’s mid-level, and if that person moves between teams, it can be awkward. A clear, shared levels framework prevents this confusion. This gets us back to compensation. Without a clear and shared understanding of levels, an organization may have two people doing the same thing but ranked differently, or two people ranked the same but with differing expectations. Since compensation is typically tied to levels, team members, particularly those who are expected to do more, but are earning less, will feel the unfairness. A clarified levels structure makes sure that folks are appropriately ranked, and helps a company’s compensation consultants do better benchmarking when comparing a company with the broader market. Without it, all these important operations are untethered, with arbitrary decisions made in the moment that, when combined lead to an incoherent mess. Levels work as a ‘core service’ that ties together these elements into a cohesive whole.